This is a new take on an age old problem purging or rotating outdated logging information from servers and workstations alike. 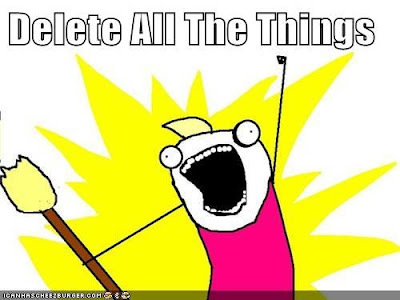 I am sure there are hundreds if not thousands of batch files and PowerShell scripts that delete old log files, but what if someone wrote one that not only deletes the old files but is also self aware. Ok.. Maybe not self aware and a far cry from Skynet, but how about one that allows you to schedule and un-schedule it self using the provided parameters as a Windows Scheduled Task. Well look no further someone has; drop the snippet below into a file called Delete-Logs.ps1 and you too can delete all the things with ease. I have tested this script with Windows 7 and Server 2008 using PowerShell 2.0. While researching I discovered there are also some convenience cmdlets for task scheduler allowing you to manage tasks however, for compatibility reasons I decided stick with schtasks.exe. You will notice I had to remove the path characters from the task name :.(. I had to remove them because of a bug limiting special characters from the scheduled task name. Invoke-Expression "C:\Windows\System32\schtasks.exe /create /tr `"`"$PSHome\powershell.exe`" -File '`"'$($MyInvocation.MyCommand.Path)'`"' -Path '`"'$($Path.Value)'`"' -Include '`"'$Include'`"' -Days $Days`" /tn `"Rotate $($Path.Name) every $Days days`" /sc daily /mo $Days /st 00:00 /ru SYSTEM"
Invoke-Expression "C:\Windows\System32\schtasks.exe /delete /tn `"Rotate $($Path.Name) every $Days days`" /F"
Write-Host "Begin log rotation of $($Path.Value) at $start"
Write-Host "End log rotation of $($Path.Value) at $end $count file(s) were rotated in $duration"